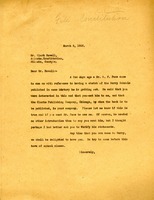 Berry writes to Clark Howell, asking him to verify information given to her by a Mr. S. F. Pace. Pace tells Berry that Howell sent him there because Clark Publishing Company was interested in publishing a sketch of the Berry schools. Berry wants to know if the company is truly Howell's and if Howell really sent Pace to see her. She tells him she would be delighted to have him come visit the school before the end of the current term. In his reply he says his only connection with the publishing company is a contract he made with them two years ago to write a history of Georgia, which he already completed. He had nothing to do with the Berry school sketches, and Pace came to Martha without authority from Howell. He hopes he can visit the school despite his busy schedule.